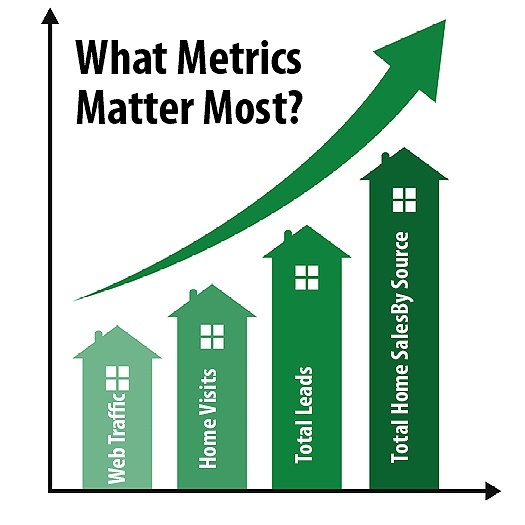 What Home Builder Marketing Metrics Drive Improvement? For years, homebuilders have lived by the adage: “Measure twice and cut once.” They know the importance of proper measurement when it comes to building a quality home. Building houses, however, isn’t the only thing a homebuilding business does. Before you can build a house, you have to have a client. That’s where marketing comes in. You’ve got to get in front of the right people with the right message in order to win some of them as clients. That, however, requires measurement as well. But in addition to making sure your measurements are accurate, you also need to make sure you’re measuring the right things. What homebuilder marketing metrics drive improvement in lead generation and in turning prospects into clients? Let’s look at some key ones. This is where almost everything starts these days. Potential homeowners begin their search for homes on the Web. How is the traffic on your website? If not enough people are visiting your site you’ve got a problem. When your ideal prospects look for information, are they finding you? And while visits to your site alone aren’t the total picture, if people aren’t finding you at all, you need to know. How do you stack up against your competitors when it comes to traffic? One way to get some answers is by having an inbound marketing assessment that gives you a picture of how effective your website is—and provides some actionable insight into how to improve your web traffic. Homebuilders have been having Open Houses for years. It’s a great way to actually show prospects what you can do. It makes things “real,” and it also allows you to interact personally with prospective clients. But how many visits are you getting? Are you following up on those visits, or are those leads slipping out the back door? Not only do you need to measure visits—you also need to have a plan for using that information. This may seem a bit obvious, but it’s important to know how many leads you’re generating. While the specific numbers may vary from builder to builder, most homebuilders have at least a rough idea of how many leads they need in order to generate a certain level of sales. If you know that 20 percent of your qualified leads end up as customers you also know that you need 50 qualified leads if you’re going to be able to build 10 homes. How many qualified leads are in your pipeline? If you’ve only got 25 solid leads, you’re probably not going to hit your target. It’s critical to know where your leads are coming from. Tracking the source of your leads (whether it’s open houses, mailers, free downloads from your website, referrals, blog posts, etc.) helps you to do more of the things that generate leads—and eliminate activities (and their associated costs) that don’t work (or figure out how to improve them). The ultimate measurement, of course, is the number of signed contracts you generate. You really want to be able to track where your sales are coming from. Again, this helps you know where to spend your marketing efforts and money. It can take some time to establish good data, but it is worth it if you can learn to be more effective with your marketing and sales efforts. When it comes to building a house, “measure twice and cut once” is a good plan. When building your homebuilder marketing process, there’s more to measure—and it’s important to measure the right things.